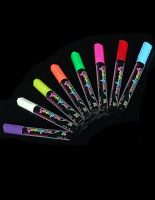 Mounting hooks on the back enable users to display in vertical or horizontal format. Quality wood construction with mahogany finish for use in any indoor environment. 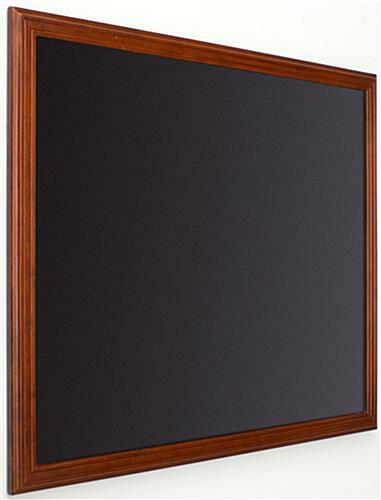 Black board writing surface for use with traditional chalk, wet-erase and liquid chalk markers. 26"w x 32"h writing area for detailed lists and big advertisements. 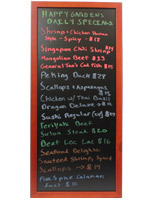 This chalk menu board, also known as a decorative blackboard is a great advertising tool for any business. 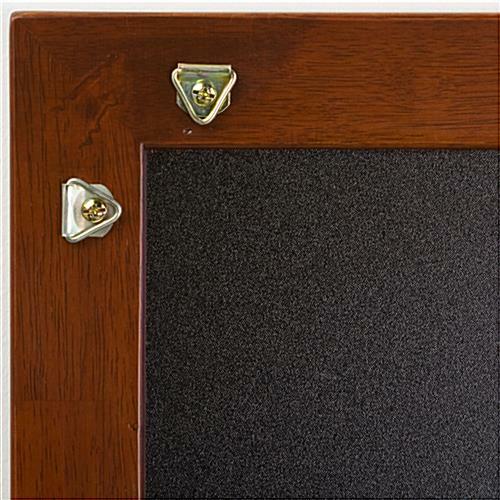 The wall-mount display is crafted from wood with a mahogany finish for an upscale appearance at an affordable price. 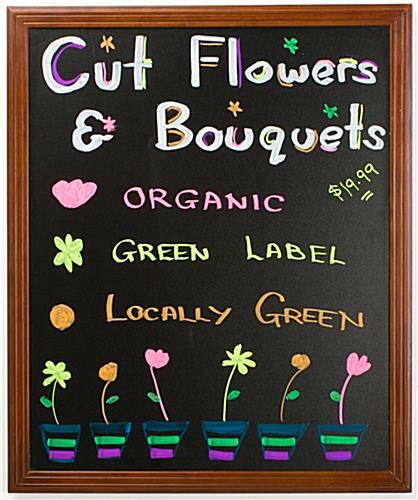 This chalk menu board is often used to promote in-store deals, special promotions and new menu listings. This wall display is the perfect way to lure customers into your store, or to draw attention to menu specials or food listings. 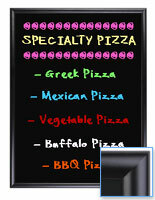 The chalk menu board enables customers to create their own advertisement or message. 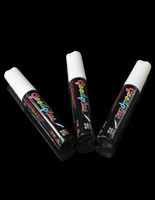 Users can get attention by writing a personalized message with a stick chalk, a wet erase markers or liquid chalk. 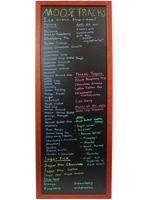 This chalk menu board is ideal for use in locations that frequently change their listings. Restaurants, pubs, bakeries, cafés, coffee shops and retail establishments all use this display. 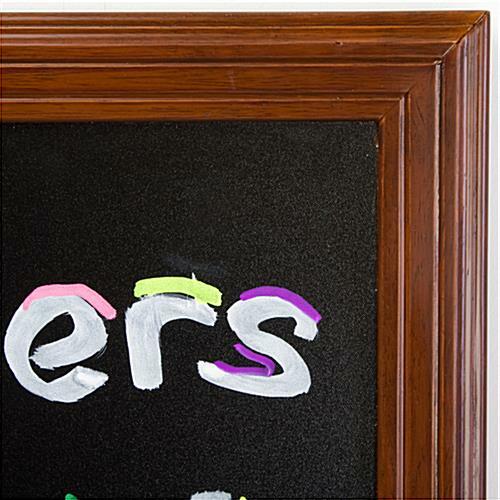 This chalk menu board, blackboard features a textured black write-on surface. 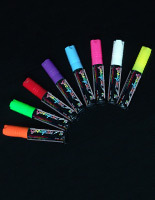 This type of surface is ideal for use with a variety of writing materials. 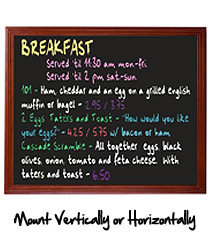 Customers can write the food listings on the chalk menu board using chalk, wet-erase or chalk markers. Messages can easily be wiped clean by using a damp cloth. 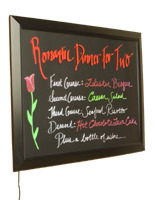 This decorative blackboard, chalk menu board features mounting hooks attached to the back of the frame for easy wall-mounting. As a result, the message restaurant display can be mounted to the wall in either vertical or horizontal format. 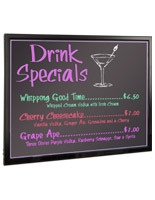 This chalk menu board is an attractive addition to almost any promotional campaign. 29.4" x 35.3" x 0.875"